✓ Provide consistent, intuitive interfacing across C/C++, Python, and LabVIEW. ✓ Minimize library dependencies for consistency across OS platforms. ✓ Minimize the learning curve when working with new BrainStem devices. ✓ Leverage BrainStem network technology and make it simple and transparent to control multiple devices with a single host connection. BrainStem devices are designed to work seamlessly in single or multi-module systems with a single host connection. The host link is made to a single BrainStem module over USB or Ethernet. 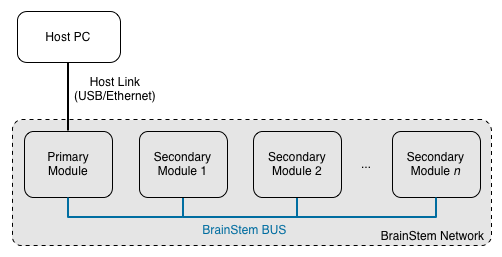 When multiple BrainStem modules are used in a system, secondary modules can be connected to the primary module over the BrainStem BUS. API commands are routed to the secondary (networked) modules through the primary BrainStem module. Any BrainStem device is capable of acting as a primary module. BrainStem Reference page and MTM Starter Kit.